A team of heralded sophomores stopped Bellevue’s state title run last year. They look tough to beat again this season. 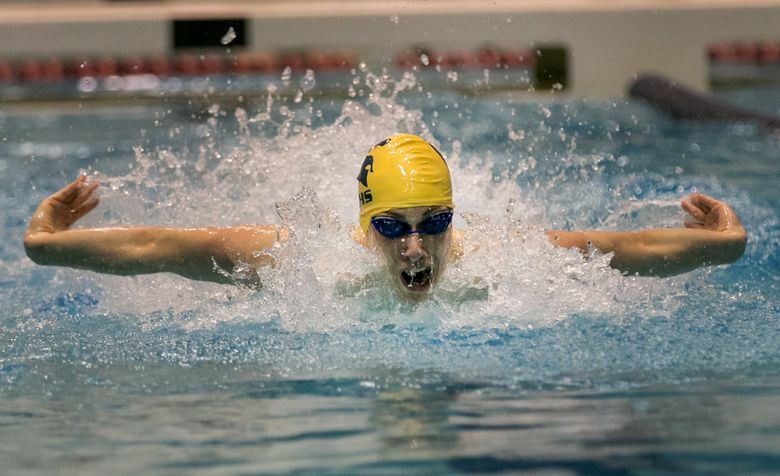 Even as the Bellevue Wolverines were winning the first of their consecutive Class 3A boys swimming titles in 2015, the conversations on the deck of the King County Aquatic Center included harbingers of what was to come. The Bainbridge High boys quickly fulfilled some of the promise coaches hinted at three seasons ago. The Spartans, led by a cadre of sophomores that were the talk of the state meet even before they enrolled at the high school, last February won Bainbridge’s first state team swim championship since Olympian Emily Silver led the girls team to titles in 2000-2001. As freshmen in 2016, Makai Ingalls, Garrett Waite and Kevin Houseman announced themselves and Bainbridge by finishing second to Bellevue, 349.5-288. A year later, the Spartans reversed that result, 369-351. Schedule: Prelims Friday, 3A: 9:45 a.m.; 4A: 2 p.m.; 2A: 6:30 p.m. Finals Saturday, 3A: 9:25 a.m.; 4A: 2:20 p.m.; 2A: 7:10 p.m. Follow along: On Twitter, @aaronlommers and @wiaawa. Top story lines: Mercer Island won six times between 2007-14, and the Islanders bring 14 top-8 individual qualifying swims, more than any other team (Bainbridge has 12) into the Class 3A meet. The Islanders are No. 2 to the defending-champion Spartans in all three relays. ... Four Class 4A teams come to state with five or more top-8 qualifying times — Issaquah, Kamiak, Skyline and defending champion Camas — which could set up a competitive finals. ... Chris Erickson’s Kamiak Knights won three 4A championships in five seasons from 2009-13 but has just one finish better than 10th in the past four years (third in 2015). But with the top qualifying time in two of the three relays and six top-8 individual qualifying times, Kamiak may be poised to challenge this week. ... Kingston brings the top qualifying time in all three relays into the Class 2A meet, as well as the top two spots in the 200 IM from Timothy Gallagher and Ethan Fox, as it tries to repeat as champs. Nathan Ramey (North Kitsap, Jr) led an underclassman-dominated field in the 2A 500 free as a sophomore, winning by just over two seconds in 4:43.91, a race in which the top four finishers were either sophomores or freshman and all were within six seconds of the top spot. Last: Highline senior Tyler Goodspeed, the top returning finisher in the Class 2A 50 freestyle and 100 butterfly (second in both a year ago), may be a Pirate athletically, but in reality actually attends Seattle Christian Schools. Goodspeed swims for Highline since Seattle Christian doesn’t offer swimming. The progression makes Bainbridge the odds-on favorite to continue its run at this weekend’s state meet in Federal Way, though nobody in the program will take anything for granted. That work ethic drives this Spartans squad, which won five individual titles and all three relays a year ago. Ingalls is the defending 500 freestyle and 100 butterfly champion. Waite won the 200 IM, a race in which Houseman finished third, and Houseman won the breast in an All-America Automatic time of 55.64 seconds. For these three, and the rest of the Bainbridge team, such performances simply extend a winning tradition on this small island nestled between Seattle and Bremerton. Silver, who won an Olympic silver medal in 2008, is probably the most famous swimming graduate of Bainbridge High. But even after she left the school, the Spartans had solid runs — including three second-place girls finishes in 2009, 2010 and 2013. For his part, Houseman may be on a trajectory that puts him in some rarefied swimming air. Houseman swam a personal-best 54.69 in the 100 breast at the Washington Open on Jan. 11. “He’s the fastest 16-year-old in the country,” Taylor said. Even on his own team. Sophomore Jude Wenker has broken a minute in the breast in the past. He’s the owner of the fifth individual title from a year ago with his 46.96 in the 100 free as a freshman.